Extracts from Laminaria hyperborea could possibly be fermented to ethanol commercially. In particular, seaweed harvested in the autumn contains high levels of easily extractable laminaran and mannitol. Four microorganisms were tested to carry out this fermentation, one bacterium and three yeasts. Only Pichia angophorae was able to utilise both laminaran and mannitol for ethanol production, and its substrate preferences were investigated in batch and continuous cultures. Laminaran and mannitol were consumed simultaneously, but with different relative rates. In batch fermentations, mannitol was the preferred substrate. Its share of the total laminaran and mannitol consumption rate increased with oxygen transfer rate (OTR) and pH. In continuous fermentations, laminaran was the preferred substrate at low OTR, whereas at higher OTR, laminaran and mannitol were consumed at similar rates. Optimisation of ethanol yield required a low OTR, and the best yield of 0.43 g ethanol (g substrate)−1 was achieved in batch culture at pH 4.5 and 5.8 mmol O2 l−1 h−1. However, industrial production of ethanol from seaweed would require an optimisation of the extraction process to yield a higher ethanol concentration. 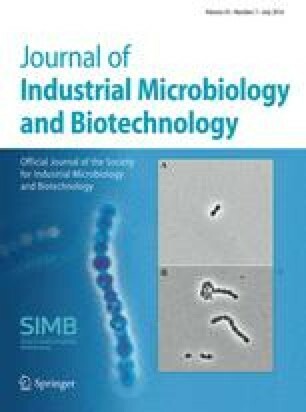 Journal of Industrial Microbiology & Biotechnology (2000) 25, 249–254.